Li, Z., Yu, Y., Sun, J., Li, D., Huang, Y., and Feng, Y. (2016). "Effect of extractives on digestibility of cellulose in corn stover with liquid hot water pretreatment," BioRes. 11(1), 54-70. Many herbaceous lignocelluloses suitable for ethanol production have high extractives contents, such as some straws and corn stover. The high extractives content might affect pretreatment or enzymatic hydrolysis. In this study, extractives were removed from corn stover, and then extractives-free corn stover and ordinary corn stover were respectively pretreated using a liquid hot water (LHW) method and hydrolyzed to evaluate the effect of extractives on cellulose digestibility. Extractives-free corn stover presented higher cellulose digestibility than ordinary corn stover after the same pretreatment conditions. A total of 87.3% of cellulose was digested in extractives-free corn stover, compared to 71.0% in ordinary corn stover, after pretreatment at 200 °C for 20 min. It is speculated that some water-soluble extractives could buffer H+ ions from water and acetic acid during LHW pretreatment process, reducing xylan removal. Another reason for these results might be that some extractives could condense on corn stover after LHW pretreatment, which hinders cellulose hydrolysis. Extractives are a variety of chemical components in lignocellulosic biomass that are not chemically bound to components of biomass and can be extracted from lignocellulosic biomass using various solvents (Sluiter et al. 2005). The studied extractives components include inorganic material, carbohydrates, phenols, aromatics, hydrocarbons, lipids, fats, and waxes, which can be extracted by water, ethanol, benzene, toluene, and their mixtures (Chen et al. 2010; Lin et al. 2010; Naik et al. 2010; Sluiter et al. 2010; Vassilev et al. 2012). The composition and quantity of the extractives depend on biomass species and where it is produced. A high extractives content is characteristic of herbaceous and agricultural fibers, grasses, and residues such as some straws, sugar cane, and corn stover (Vassilev et al. 2012). For example, the extractives contents in corn stover reported in the literature range from 7.3% to 23.5% (Huber et al. 2006; Liu et al. 2013). LHW is a form of pretreatment that does not use any catalysts or chemicals (Kou et al. 2013). During LHW pretreatment, water and acetyl groups within hemicelluloses, which act as acids at elevated temperatures (generally at 160 to 240 oC), can catalyze hydrolysis of hemicelluloses to hemicellulose oligomers and hemicellulose monomers (Cara et al. 2007; Wan and Li 2011; Xiao et al. 2011). The reference investigations show that water-soluble extractives in biomass include various cations and anions (such as K+, Na+, HCO32-, and PO43-) (Fahmi et al. 2007; Miller and Miller 2007; Piotrowska et al. 2010). These ions might affect catalytic hydrolysis of hemicelluloses during LHW pretreatment process. In addition, Tamaki and Mazza (2010) reported that extractives from some straws contain some soluble materials that become insoluble during a sequential acid hydrolysis procedure utilizing 72% H2SO4 at 30 oC for 1 h and followed by 4% H2SO4 at 121 oC for 1 h. Thammasouk et al. (1997) concluded that some of the extractives from herbaceous biomass (switch grass, corn stover, and fescue) could be condensed and quantified as lignin using a strong acid-hydrolysis method for lignin quantification. There are few reports on the role of extractives during LHW pretreatment and enzymatic hydrolysis after LHW pretreatment. In a previous study a LHW pretreatment process was set up to pretreat corn stover. The results showed that corn stover with higher extractives content was enzymatically hydrolyzed to a lesser extent than corn stover with low extractives content after the same LHW pretreatment conditions. In the present study, the influence of extractives on the digestibility of cellulose in corn stover after LHW pretreatment was evaluated, and mechanisms consistent with these observations are suggested. Air-dried corn stover was collected from Suihua, Heilongjiang Province, China. Corn stover was ground until the entire material passed through a 2-mm sieve, and then it was sieved to obtain 40- to 60-mesh fractions and stored at −20 oC. The initial composition of corn stover was assayed by the National Renewable Energy Laboratory (NREL) laboratory analytical procedure (Sluiter et al. 2005, 2006, 2008). The results are shown in Table 1. Four grams of screened, air-dried corn stover were placed in an extraction thimble, which was then inserted into a Soxhlet tube. High-performance liquid chromatography (HPLC)-grade water (190 mL) was added to the receiving flask of the Soxhlet extractor. The heating mantles were maintained at five siphon cycles per hour. The dry weight of corn stover was measured after every 8 h of reflux. Corn stover was refluxed to constant weight. Constant weight is defined as less than ± 4 mg change in the dry weight of corn stover. 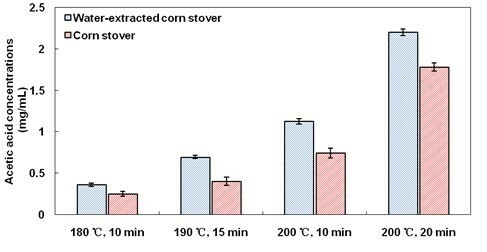 After water extraction, water-soluble extractives (WSE) had been removed; the corn stover was dried in a vacuum oven at 40 oC for 24 h and defined as water-extracted corn stover. Then, 190 mL of 190 proof ethyl alcohol was added to the receiving flask of the Soxhlet apparatus. The heating mantles were maintained at 10 siphon cycles per hour, and water-extracted corn stover was refluxed to constant weight (Sluiter et al. 2005). 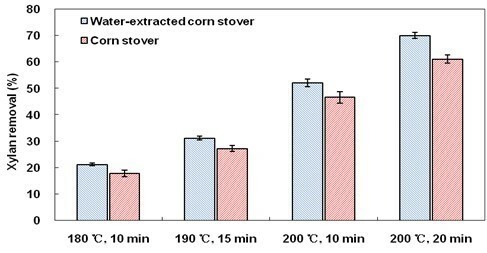 After water and ethanol extraction, the corn stover was dried in a vacuum oven at 40 oC for 24 h and defined as extractives-free corn stover. LHW pretreatment was conducted in a batch tube reactor (total volume: 50 mL) encased in a 316-L stainless steel reactor. The tubes were sealed with Swagelok fittings as well as Teflon® gaskets at both ends. Three grams (moisture content: 4.4%) of corn stover or 2.48 g of extractives-free corn stover or 2.64 g of water-extracted corn stover and 27 mL of de-ionized (DI) water were mixed together in the reactor, which was then heated to the designed temperature in an oil bath (Tianjing, Jiangsu, China). After pretreatment, the reactor was cooled by quenching in a room-temperature water bath to end the reaction. The pretreated slurry was vacuum-filtered to obtain the liquid fraction (hydrolyzate) for further analysis. The water-insoluble solids (WIS) on the filter paper were extensively washed with hot distilled water and then dried in a vacuum oven at 40 oC for 24 h for enzymatic hydrolysis and composition analysis. Cellulase (Celluclast® 1.5 L, 75 FPU/mL) and β-glucosidase (Novozyme 188, 614 CBU/mL), both from Sigma-Aldrich (Shanghai, China), were used, with initial loadings of 15 FPU and 15 CBU/g glucan, respectively. Enzymatic hydrolysis was conducted in 0.05 M citrate buffer (pH 4.8) containing 40 μg/mL tetracycline and 30 μg/mL cycloheximide. 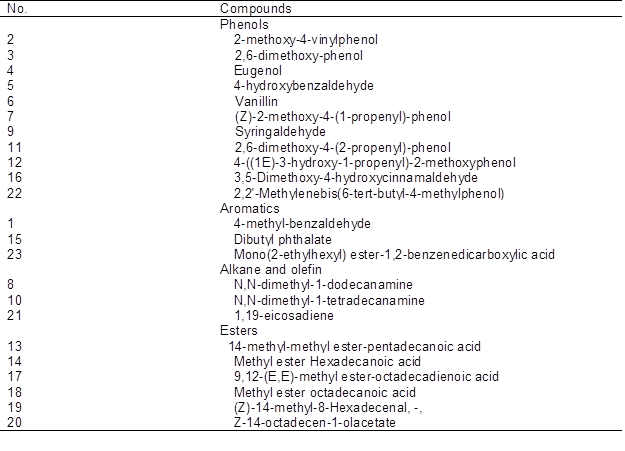 The initial glucan concentration was 1% (w/v), based on 50 mL of total liquid. The enzymatic hydrolysis reaction mixture was placed in flasks and incubated at 50 oC on a rotary shaker at 150 rpm. One-milliliter samples were collected after 72 h and centrifuged at 10,000 rpm for 10 min, and the supernatant was filtered through a 0.22-μm membrane for glucose determination. The xylan contents of WIS fractions, acetic acid in the hydrolysate, and glucose released from enzymatic hydrolysis were determined according to NREL laboratory analytical procedures (Sluiter et al. 2006, 2008). To evaluate the buffering capacity of the WSE, 30 g of corn stover was soaked in 270 mL of DI water at 25 °C for 30 min. The solid material was removed by filtration and the liquid was titrated with 0.01 M H2SO4. DI water was used as a reference (Linde et al. 2006). Samples sputter-coated with Au were imaged with a Helios-600i scanning electron microscope (FEI Technology Development, Hillsboro, OR, USA) using an accelerating voltage of 20 kV. Ethanol-soluble extractives were evaporated to dryness and redissolved in chloroform for gas chromatography-mass spectrometry (GC-MS) analyses. The GC-MS analyses were performed with an Agilent 6890N-5973N system (Agilent Technologies, Santa Clara, CA, USA) using a DB-5MS capillary column (30 m × 0.25 mm internal diameter, 0.1 μm film thickness). The temperature program was started at 60 oC with a 3-min hold, then raised to 300 °C at 10 °C/min and held for 2 min. The injector detector temperatures were set at 280 °C. Helium (1 mL/min) was used as the carrier gas, and the injection was performed in splitless mode. The MS was operated in electron impact (EI) mode. The temperature of the interface and the ion source were set at 280 and 230 °C, respectively. The acquisition of data was conducted in SCAN mode. The scan range covered 15 to 750 m/z. 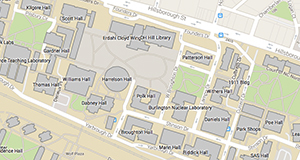 The compounds were identified by mass fragmentography and by comparing their mass spectra with those of the NIST libraries and standards. Pseudo-lignin extracted from pretreated corn stover was added to pretreated extractives-free corn stover to deposit pseudo-lignin onto pretreated extractives-free corn stover. The LHW-pretreated corn stover (pretreatment conditions: 180 oC, 10 min; 190 oC, 15 min; and 200 oC, 10 min in turn) were respectively reﬂuxed with p-dioxane to constant weight under nitrogen. The LHW-pretreated extractives-free corn stover (pretreatment conditions: 180 oC, 10 min; 190 oC, 15 min; and 200 oC, 10 min) were respectively added to the corresponding pseudo-lignin solution in turn, and the slurry was allowed to stir at room temperature for 2 h. The mixtures were transferred to aluminum weigh dishes and allowed to air-dry in fume hood (Hu et al. 2012). Extractives were removed from corn stover, and the extractives-free corn stover was hydrolyzed by cellulase to determine the effects of extractives on enzymatic hydrolysis of cellulose. LHW pretreatment was selected as the processing method before enzymatic hydrolysis. The results are shown in Fig. 1. Extractives-free corn stover presented obviously higher cellulose digestibility than corn stover after all LHW pretreatment conditions. For example, after LHW pretreatment at 200 °C for 20 min, 87.3% of cellulose in extractives-free corn stover was digested, compared to 71.0% in the case of ordinary corn stover. Xylan removal is typically the key reason that LHW pretreatment is able to promote cellulose digestibility (Liu and Wyman 2003). The xylan removal analysis is illustrated in Fig. 2, which shows that extractives might influence the effectiveness of the LHW pretreatment on xylan removal. 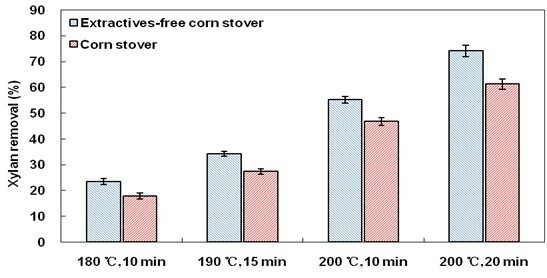 For example, after LHW pretreatment at 200 °C for 20 min, 74.1% of xylan in extractives-free corn stover was removed, in contrast to 61.2% for ordinary corn stover. Hence, one of the reasons that extractives influence cellulose digestibility is because of the effect of xylan removal. In LHW pretreatment, the H+ concentration is a critical factor in the catalytic removal of xylan. Buffering might prevent acid production and makes the pretreatment appear less severe. The buffering capacities of WSE were determined by water extraction and titration with 0.01 M H2SO4. Figure 3 shows the titration curve of the corn stover water (1000 mL) and of deionized water (1000 mL). A decrease in pH from 6.6 to 4.0 in deionized water resulted in the consumption of 4 mL of 0.01 M H2SO4, whereas a decrease in pH from 6.0 to 4.7 in corn stover water resulted in the consumption of 60 mL of 0.01 M H2SO4. The difference in pH is probably due to the buffering capacity of WSE. There are two mechanisms of H+ liberation in LHW pretreatment. One is from ionization of water at elevated temperatures. The other is from ionization of acetic acid hydrolyzed from the acetyl groups of hemicelluloses (Yu et al. 2013). In order to evaluate the effect of buffering to H+ by WSE precisely, water-extracted corn stover were also pretreated by LHW method. Water-extracted corn stover still presented obviously higher xylan removal than ordinary corn stover after all LHW pretreatment conditions (Fig. 4). The data in Fig. 5 suggest that when WSE were absent, the pH of the hydrolysate was consistently lower than that with WSE across all LHW pretreatment conditions. This result might be explained as follows. H+ ionized from water first catalyzed xylan removal as well as acetic acid liberation. When WSE were present, the buffering to H+ by WSE resulted in a decrease in xylan removal (Fig. 4), as well as a decrease in acetic acid production. Then, WSE also buffered H+ from acetic acid, leading to a decline in the autocatalysis of hemicellulose hydrolysis. This conclusion is further supported by the observation that the acetic acid concentrations in hydrolyzates of pretreated extractives-free corn stover were generally higher than those in hydrolyzates of corn stover (Fig. 6). Therefore, the buffering to H+ by extractives in LHW pretreatment inhibited xylan removal from corn stover, ultimately resulting in a decrease in cellulose digestibility. Scanning electron microscope images of untreated and pretreated extractives-free corn stover and corn stover are shown in Fig. 7 and Fig. A1. Ballesteros et al. (2011) reported the condensation of extractives during steam explosion of olive tree prunings, which might hinder the accessibility of enzymes to cellulose. After LHW pretreatment, the condensation of extractives was also observed on the corn stover surface. After pretreatment under relatively mild conditions (180 oC, 10 min; 190 oC, 15 min; and 200 oC, 10 min), no droplets were observed on the extractives-free corn stover, but droplets could be observed on the surface of corn stover (Fig. 7 and Fig. A1). This observation implies that these droplets on pretreated corn stover might be formed by condensation of extractives. After pretreatment under relatively severe conditions (200 °C, 20 min), some small droplets were observed on extractives-free corn stover (Fig. 7 E and F) and larger droplets were observed on the surface of corn stover (Fig. 7 G and H). The droplets on extractives-free corn stover were likely formed in the following pathway: lignin migrated within and out of the cell wall and were redeposited on the surface of plant cell walls under severe conditions (Donohoe et al. 2008). This observation implies that the larger droplets on corn stover pretreated at 200 °C, 20 min might be formed in the pathway described above, and condensation of some substances in extractives might occur. Hence, these droplets on pretreated corn stover appeared much larger and covered a wider area than those on the surface of pretreated extractives-free corn stover (Figs. 7 E, F, G, and H). 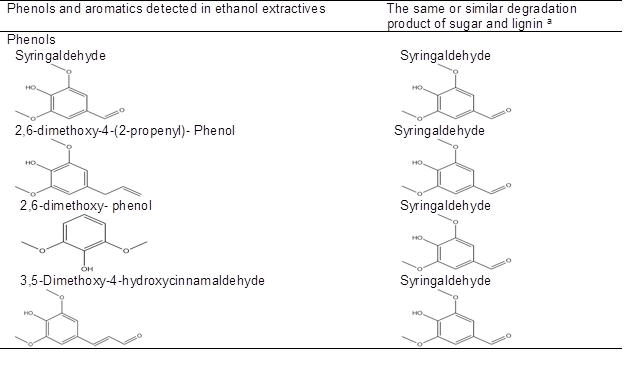 It has been reported that carbohydrates underwent acid-catalyzed dehydration, fragmentation, rearrangement, polycondensation, and/or polymerization reactions during dilute acid pretreatment to produce an insoluble material termed pseudo-lignin, which consists of aromatic, aliphatic, and carboxylic structures and inhibits enzymatic hydrolysis of cellulose (Sannigrahi et al. 2011; Hu et al. 2012). Condensation of extractives during LHW pretreatment might also occur by these same processes with respect to free glucose in WSE (the content of free glucose in corn stover was 3.1%). In addition, droplets were also observed on water-extracted corn stover (carbohydrates had been removed) after pretreatment under relatively mild conditions (180 °C, 10 min; 190 °C, 15 min; and 200 °C, 10 min) (Fig. A2). This indicates that some materials in ethanol-soluble extractives might also form droplets after LHW pretreatment. The GC-MS chromatogram of ethanol-soluble extractives (Fig. A3) shows that the components in ethanol-soluble extractives include phenols, aromatics, alkanes, olefins, and esters (Table A1). 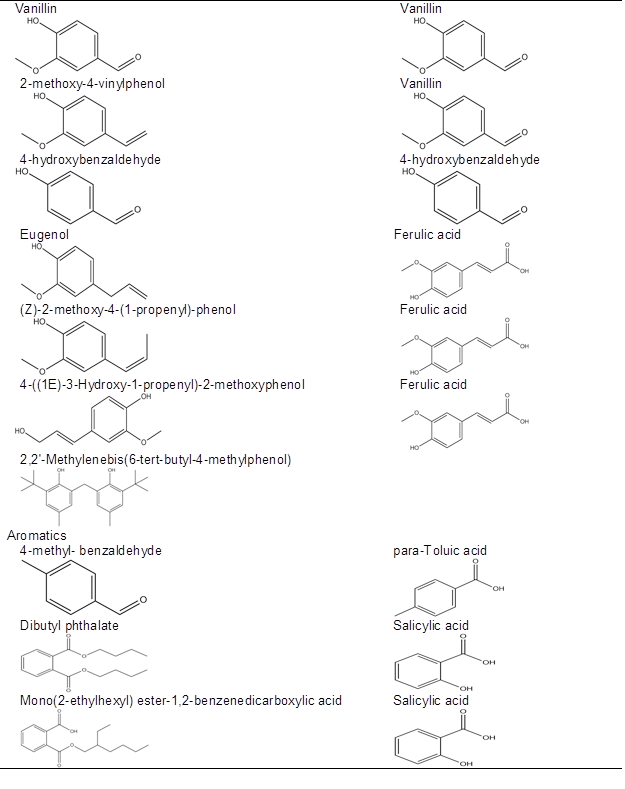 It is notable that the structure of some phenols and aromatics in ethanol-soluble extractives are the same or similar to degradation products of carbohydrates and lignins (Table 2) (Du et al. 2010; Rasmussen et al. 2014). It is very likely that these phenols and aromatics might form droplets (pseudo-lignin) by polycondensation and/or polymerization during LHW pretreatment. a Degradation product observed in corn stover hydrolyzates after dilute acid and LHW pretreatment (Du et al. 2010; Rasmussen et al. 2014). The effect of droplets on cellulose digestibility was further verified by comparing cellulose digestibility of LHW-pretreated extractives-free corn stover and LHW-pretreated extractives-free corn stover to which droplets (pseudo-lignin) had been applied to their surfaces. 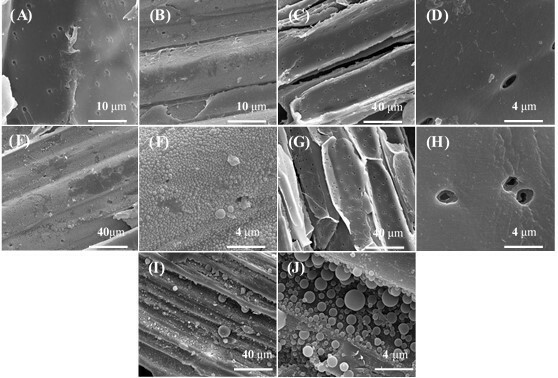 After p-dioxane extraction, droplets on the surface of LHW-pretreated corn stover had been removed, while after pseudo-lignin addition droplets were observed on the surface of LHW-pretreated extractives-free corn stover, which were originally smooth (Fig. A4). These observations indicate that droplets could be dissolved by p-dioxane extraction and condense on the surface of LHW-pretreated extractives-free corn stover after the pseudo-lignin addition process. LHW-pretreated extractives-free corn stover presented higher cellulose digestibility than LHW-pretreated extractives-free corn stover which were added droplets on their own surface (Fig. 8). This result indicates that droplets formed by extractives are crucial for enzymatic digestibility because these droplets might block the enzyme’s access to cellulose. After enzymatic hydrolysis pores and cracks caused by enzymatic hydrolysis were observed on both LHW-pretreated extractives-free corn stover and LHW-pretreated corn stover, but pores and cracks on LHW-pretreated extractives-free corn stover appeared much clearer and covered a wider area than those on the surface of LHW-pretreated corn stover (Fig. A5). The reason might be that droplets on the surface of LHW-pretreated corn stover block the enzyme’s access to cellulose in LHW-pretreated corn stover. 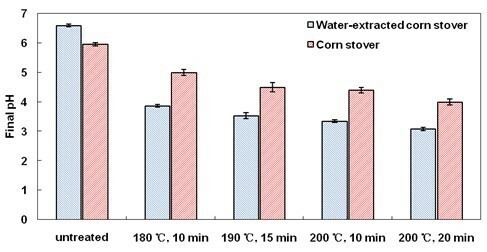 After enzymatic hydrolysis small droplets were not observed on LHW-pretreated extractives-free corn stover pretreated at 200 °C, 20 min, and droplets on LHW-pretreated corn stover appeared much smaller and covered a smaller area than those on the surface of LHW-pretreated corn stover before enzymatic hydrolysis (Fig. A5). Li et al. 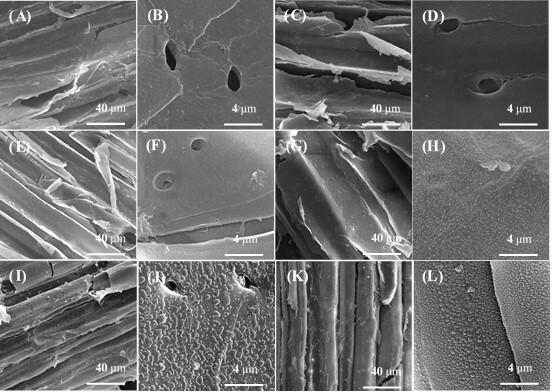 (2014) observed a similar phenomenon in an investigation of lignin deposition on cellulose during hydrothermal pretreatment and its effect on cellulose hydrolysis. 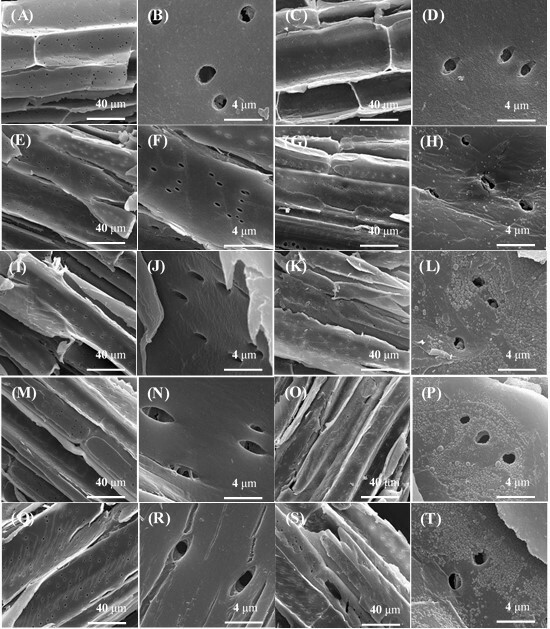 The reason might be that with alteration of surface chemistry by hydrolysis of adjacent cellulose chains, the droplets are either “peeled off” or “pushed off “from the cellulose surface, allowing hydrolysis to continue (Li et al. 2014). Sequential water and ethanol extraction resulted in a lower cellulose digestibility after liquid hot water (LHW) pretreatment. Water-soluble extractives could buffer H+ from both water and acetic acid released from corn stover during the LHW process, resulting in a decrease in xylan removal. Some extractives could condense on the surface of corn stover after LHW pretreatment, hindering enzymatic hydrolysis of pretreated material. The research was supported by the National Science Fund for Distinguished Young Scholars of China (51125033) and the Open Project of Shanghai Key Lab for Urban Ecological Processes and Eco-Restoration (SHUES2014A02). The authors also acknowledge the Funds for Creative Research Group of China (51121062). Sluiter, A., Ruiz, R., Scarlata, C., Sluiter, J., and Templeton, D. (2005). “Determination of extractives in biomass,” in: Laboratory Analytical Procedure (LAP), NREL/TP-510-42619, National Renewable Energy Laboratory Golden, CO (http://www.nrel.gov/biomass/analytical_procedures.html). Sluiter, A., Hames, B., Ruiz, R., Scarlata, C., Sluiter, J., and Templeton, D. (2006). “Determination of sugars, byproducts, and degradation products in liquid fraction process samples,” in: Laboratory Analytical Procedure (LAP), NREL/TP-510-42623, National Renewable Energy Laboratory Golden, CO (http://www.nrel.gov/biomass/analytical_procedures.html). Sluiter, A., Hames, B., Ruiz, R., Scarlata, C., Sluiter, J., Templeton, D., and Crocker, D. (2008). “Determination of structural carbohydrates and lignin in biomass,” in: Laboratory Analytical Procedure (LAP), NREL/TP-510-42618, National Renewable Energy Laboratory Golden, CO (http://www.nrel.gov/biomass/analytical_procedures.html). Article submitted: April 8, 2015; Peer review completed: September 12, 2015; Revised version received and accepted: September 22, 2015; Published: November 6, 2015.